THOUGH many of the boat building companies either went bust or greatly reduced their output when the bottom fell out of the industry, one company is bucking the trend by expanding into a new factory. 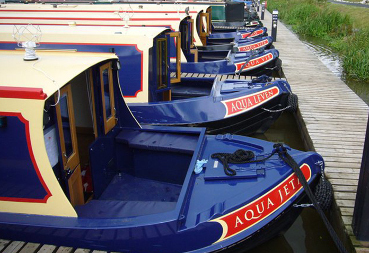 Currently based at Mercia Marina, Aqua Narrowboats has secured planning permission for a 7,500 sq ft factory at Tomlinson Business Park in Foston, South Derbyshire, and is recruiting new staff. 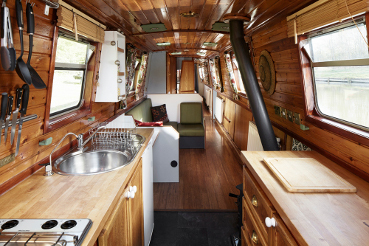 The company was first formed by its Managing Director Justin Hudson-Oldroyd in 2004 at Kings Bromley but moved to the then new Mercia Marina. However it has outgrown its premises so intends to move to its new factory in September. Aqua produces somewhat unusual boats, breaking away from the traditional design, that have proved to be popular, and the company will be able to increase production in its new premises. The photograph shows an interior. The one flaw in the move is that the new factory, unlike its present premises, will not be canal-side, so each build will have to be loaded onto a lorry and transported to where it can be launched. For this purpose a crane has had to be installed. In addition to the move of its building operation being moved from Mercia, the company is also relocating its hire fleet away from the marina and to Barton Turns Marina, though still on the Trent & Mersey Canal.